When you pray, you want to know what you're saying — as you're saying it! Now you will! Thanks to an expert team of scholars, writers, editors, and graphic designers, ArtScroll's new Interlinear Series is here — the revolutionary new way to add meaning and understanding to prayer. The patent-pending use of arrows directs your eye in the right direction so that you can keep following along. 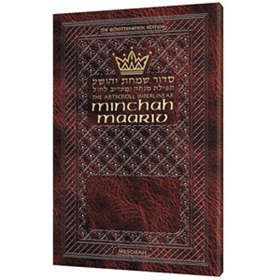 Includes complete Minchah, Maariv, Bircas Hamazon, Tefillas Haderech and more!